Save a little girl from her nightmares! Calming Lia is a relaxing match-three game. Like a lullaby, it is best played at night before sleeping. Help Lia and her plush friend, Bao the bear, rescue her dreams from the horrors of the evil Boogie Man! Meet cute Lia and Bao in this match-3 game. Experience the marvelous visuals and calming soundtrack! Travel through beautiful worlds, Deep Sea, Spooky Circus and much more in this cute adventure of Lia’s dreams. 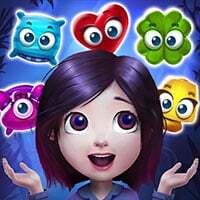 Slide and match marvelous roomies in this cute match-3 adventure game. Collect cute charms, beautiful diamonds and marvelous gold! Make sure to check out House of Anubis The Song of Dreams Game. You may enjoy playing it.